Healthcare technology decision makers and buyers don't "stop by" booths. 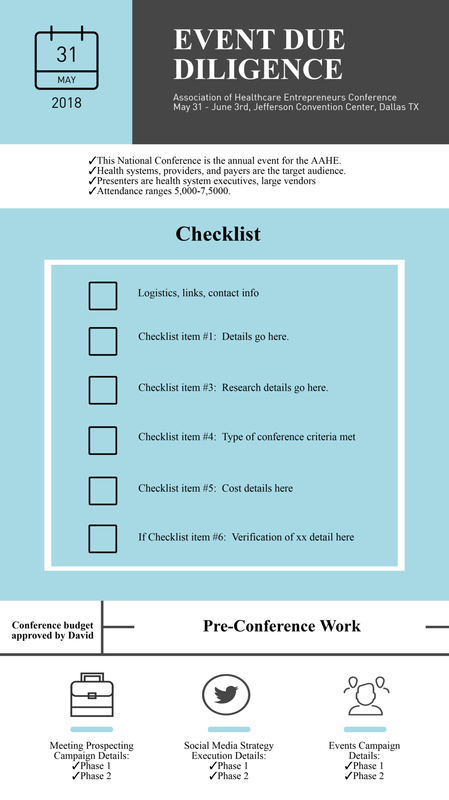 There is an art to selecting the right conferences for your product and a due diligence checklist that must be met before a decision is made to attend, exhibit, or speak at a conference. Value Prop Shop helps you not only identify the conferences that will yield the highest ROI - we provide best practice methodology to secure booth meetings or sponsored event attendance prior to the conference. We also partner with conference vendors, such as Geaux Expo that are disrupting this traditionally costly and impersonal space with innovative solutions and services that are tailored to startups on a budget. You no longer need to only take the traditional and costly approach of being a conference exhibitor. We help our clients identify clinical evangelists for speaking engagements to engage decision makers without paying high registration fee. We help with proposal submissions to secure these engagements. If scheduling permits, our nationally sought-after clinical thought leaders can speak at qualified conferences on your behalf.